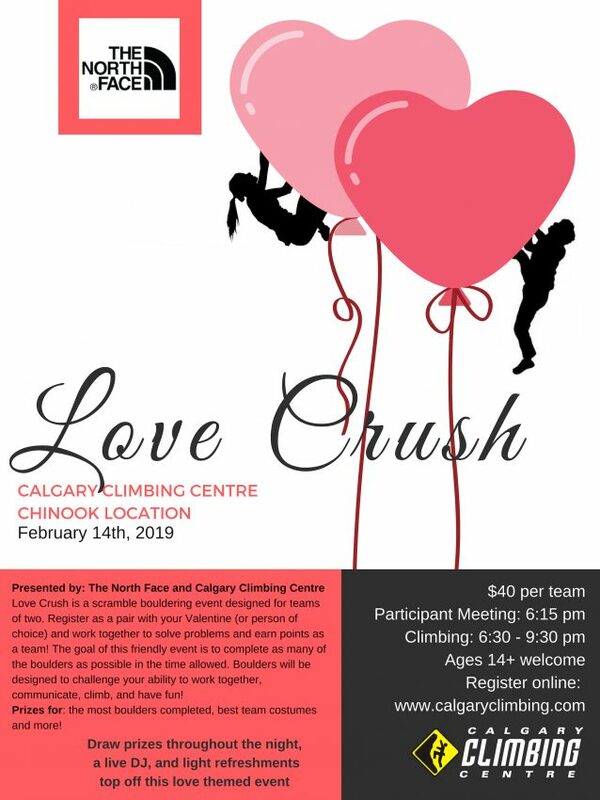 CCC’s Love Crush Session is a scramble event for teams of two. Register as a pair with your valentine and earn points together! The goal of this friendly session is to complete as many of the boulder problems as you can in the time limit. You can expect boulders to challenge your ability to work together, communicate and climb. Attempt to conquer cupids’ challenges on friendship boulders, on the wall twister, and many more fun obstacles. You must register as a team of two….you need two names and info. Space is limited. The North Face will be sponsoring this event with a DJ, draw prizes and food. When: Thursday February 14th at CCC Chinook. Cost: $20+gst/climber. Day pass not included. You must register as a team of two. Register Here for this event. WE ARE SOLD OUT. THANK YOU! Want to check out the video for this event from a previous year. Go HERE.